From the footpaths of our cities to the chat rooms of the Internet, people are connecting today as never before. As the planet shrinks through the multiple forces of immigration, travel, electronic communication and more fluid employment patterns, we will find ourselves increasingly forced into contact with those who are significantly different from ourselves. Sadly however, the stranger is often a threat to be resisted rather than a friend to be embraced. In this context of in-your-face diversity, it is time to revisit the heart of the New Testament, with its claim that in Jesus Christ a new quality of human relationship is possible. In his letter to the Ephesians, the apostle Paul claims that Christians are a new kind of people, part of a new community: a new humanity in Christ (Ephesians 2:15). We exist not in isolation, but in relationship. Dynamic Diversity contends that all Christian congregations everywhere are called to be bridging places, centres of reconciliation, where the major diversities separating human beings are overcome through the presence of Gods Holy Spirit. Bruce Milne presents a biblical model for today and tomorrow where the diversities of gender, generation, ethnicity, colour and socio-economic status present exciting and challenging opportunities to demonstrate practical oneness. When this happens, churches become wonderfully alive. In Christ we can be one people, one new humanity, one life. 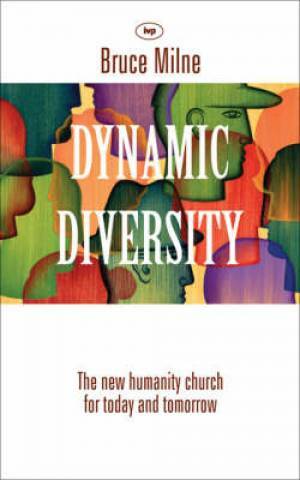 Dynamic Diversity by Milne, Bruce was published by Intervarsity Press in November 2006 and is our 32038th best seller. The ISBN for Dynamic Diversity is 9781844741588. All over the world we are connecting with each other and across the miles of the earth, contact is easier than it has ever been, the planet is shrinking. Because of this we come into contact with many different people and races and religions, people who may be significantly different to ourselves. Paul in his letter to the Ephesians stated we are a new humanity in Christ, we exist not is isolation but in relationship. This was important in Paul’s day but even more important today with conflict and mistrust ever present in our world. This book thinks through our diverse world, introduces us to the necessity of thinking like others, accepting the diversity of gender, generation, ethnicity and colour. We need to recognise that we as church members can introduce a sensible way of looking at diversity and accept the ways of others. Evidence from scripture and philosophical writings underpin the proposals and suggestions offered in this slim volume. It is definitely time to think about very uncertain future, this book gives us a starting point. Got a question? No problem! Just click here to ask us about Dynamic Diversity.